The bathroom is one room in your house where you can create the ultimate in luxury with just a few design elements. 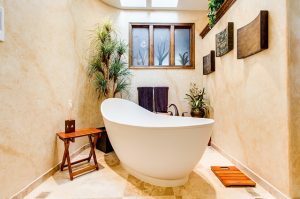 Instead of just a practical place for your morning routine, when it’s time to remodel your bathroom, take it to the next level with any of the following ideas. Tile is not just for the floor. 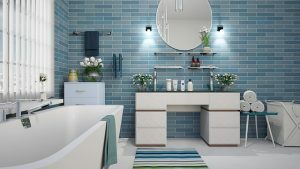 By taking your choice of tile up onto the walls you’ll extend the sight line of this feature in your bathroom, creating a more seamless look to the entire room. If floor to ceiling tile isn’t your thing, consider going two-thirds of the way up and capping the tile with a distinctive border of tile in a different design or color. Then paint the remaining wall space in a corresponding shade. Add in crown molding at the top of the walls to create a classic, finished look. Shelving is a key element in any bathroom design. Consider the entire space when planning your update, and don’t be shy about adding more shelves. Placing shelves near the sink gives you an area to have daily toiletries within easy reach. Adding shelves above the toilet or next to windows provides great storage for extra towels, and floor mats. If your bathroom is small go up as high as you can with shelves to take full advantage of the space. Using open shelves instead of cabinets will enhance the feeling of spaciousness within the room itself. Free-standing tubs and pedestal sinks will help create the illusion of more space in your bathroom through their sleeker design. These also will help show off the amazing tiles you’ve chosen and can create a statement of their own reflecting your personal style. The range of options in design, materials and colors is almost endless. A free-standing tub will make for an incredible focal point, and you’ll have more flexibility with placement too. With a free-standing tub you can add a spa-caddy shelf for holding shampoo, soaps and candles, ideal for creating the air of luxury. A pedestal sink will also provide a focal point and help keep the bathroom from feeling overcrowded. Or you can opt for an open vanity for the same basic effect. A walk-in shower is another way to add a touch of luxury without taking up too much space. This is also an excellent spot in the room to take the tile up to the ceiling, incorporating a simple pattern in the tile will also give it a splash of drama to draw in the eye. Keep it simple though, with tiles of varying shades of gray a few red or blue ones will add that pop of color without overwhelming. 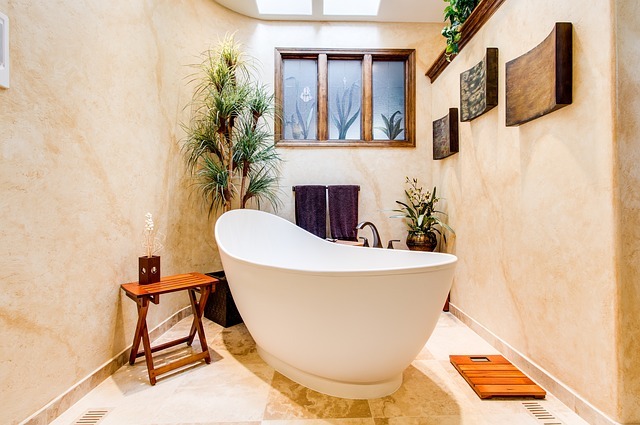 Natural elements make all the difference when it comes to creating a luxurious bathroom. Quartz countertops and stone bowl sinks will transform a bathroom cabinet into something extraordinary. 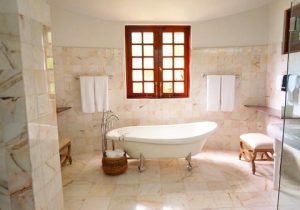 Wood evokes a sense of calm; take advantage of this in your bathroom to create a place of serenity. Consider keeping wood-framed windows and doors in their natural state with a stain to lighten or darken the grain. Instead of tile, use wood for the floor for a spa-like feeling. Add in some river rock as a wall accent, and don’t forget to incorporate plants into your bathroom oasis as well. Any of these design elements will help you create the ultimate in luxury in your bathroom. Find some inspiring bathroom designs with this gallery from HGTV. If you’re ready to experience year-round Keys living, or it’s time to sell, my team and I are here to put our experience to work for you. You can rely on us every step of the way. Please contact me, Jimmy Lane, for all of your real estate needs.